In this regarding, the State Project Director, Sarva Shiksha Abhiyan will issue the proceedings to all the DEOs and POs of SSA in the both states of Andhra Pradesh and Telangana State and conduct the activity of painting competitions on "Conservation of Energy" in all TS schools and AP Schools in the second week of October 2018 after vacation. The students studying in 4th to 9th standards are eligible to participate in the competition. As part of energy conservation mission, NTPC, in association with Ministry of Power and Bureau of Energy efficiency, jointly organizing ENERGY CONSERVATION PAINTING COMPETITION for school children. The competition is open to all government and Private schools for two groups i.e. GROUP A, of 4,5,6th classes and GROUP B;7,8,9 classes. 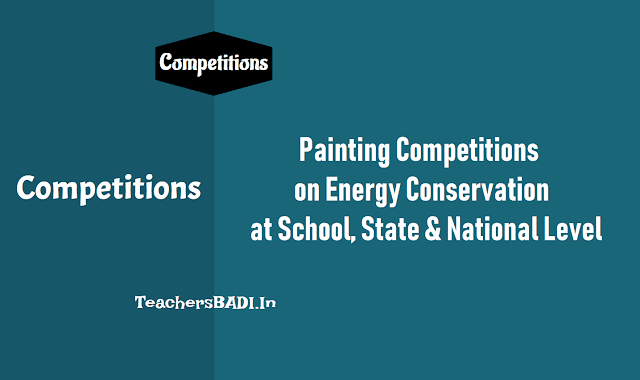 National Campaign on Energy Conservation, the Bureau of Energy Efficiency (BEE) - Organize School Level Painting Competitions to the students at the concerned schools during September - October 2018. It is to inform that, Telangana State Renewable Energy Development Corporation (#TSREDCO) is the State Designated Agency to coordinate, regulate and enforce the provisions of the Energy Conservation Act, and also for implementation of the Schemes under the said Act within the State of Telangana. Further, under the National Campaign on Energy Conservation, the. Bereau of Energy Efficiency (BEE), Ministry of Power-Government of India has launched the Painting Competition on Energy Conservation-2018 and being executed by the BEE on behalf of the Ministry and with the support of the Central Public Sector Undertakings (SPSUs). The brief details of the Painting Competition are here with enclosed. In this regard, it is requested to issue necessary orders to the concerned to encourage participation of more number of students and to organize School Level Painting Competitions to the students at the concerned schools during September - October 2018 and to forward .£.Best paintings each from Group A and Group B from each school selected by the Head Master I Principal are to the TSREDCO office, Hyderabad on or before 25-10-2018. TS SCERT Rc.No.605 :: Sub:- O/o SCERT, TS, Hyderabad - Painting Competition on Energy Conservation 2018 - from classes 4th to 9th in two groups - Reg. Ref:- Mail received from Telangana State Renewable Energy Development Corporation (TSREDCO) on l5th September 2018. The attention of all the District Educational Officers in the state is invited to the reference cited above, Telangana State Renewable Energy Development Corporation (TSREDCO) is organizing Painting Competitions under the National Campaign of Energy Conservation, the Bureau of Energy Efficiency (BEE), Ministry of Power - Government of India launched the Painting Competition on Energy Conservation - 2018. 3) Be polite, Turn off the light. 3) Energy Saving Mission, Make it a Passion. Therefore all the DEOs are requested to issue necessary orders to the concerned school to encourage participation of more no. of students and to organize school level painting competitions to the students at the concerned schools during September - October 2018 and to forward two best paintings each from group-A and group-B from each school selected by the headmaster / Principal to the TSREDCO Office. 2nd floor, The Institution of Engineers(lndia), Visvesvaraya Bhavan, Kairatabad, Hyderabad on or before 25-10-2018. The best will be selected to participate at State level Painting Competitions which is going to be organized during 10-20th November 2018 at TSREDCO Office Visvesvaraya Bhavan, Khairthabad, Hyderabad. All state level participants will be issued certificate of participation for the selected paintings at State level Competition along with cash prizes. NTPC - STATE LEVEL PAINTING COMPETITION: As you aware, NTPC, will be organizing a STATE LEVEL PAINTING COMPETITION at Hyderabad [ ....., for the students of 4,5,6 (Group'A') and 7, 8, 9 (Group"B") standards of - Telangana States on energy conservation. Bureau of Energy Efficiency (Govt. of India Ministry of Power) will be conducting National level competition subsequently for the winners of State level completion. As the campaign for energy conservation will benefit the nation a lot, we seek your kind help in passing on suitable instructions to all schools in AP for participating in the competition in large numbers. As such we once again request you to please advise all your concerned to ensure maximum participation in the said competition. Further, for the purpose of short listing of paintings received from across State and as per the guidelines of BEE, and also to select the best paintings at the State level competition to be held on 14-11-2018 at Hyderabad, it is requested that you may kindly nominate one of your Senior Officer to be as Jury member. It is pertinent to mention here that every year one senior official is nominated as jury member from Government side. The nominated member is required to visit our office for short listing of paintings received during October ,2018 and on the date of competition i.e. -09th November, 2018 for selecting best paintings at State level. 1. Category ‘A’ - students of IV, V and VI standard. 2. Category ‘B’ - students of VII, VIII and IX standard. • Students can use any size of paper but preferably A4 Size and painting material such as pencil, colour pencils, crayons & water colours. • Students can select any one of the themes topics marked for their respective Group for Painting. • Participation Certificates will be issued to all the participants. • Selected Students shall participate at State and National Level Painting Competitions. • The 1st, 2nd& 3rd prizes winners at State Level during the last TWO YEARS (2015&2016) of Group A & Group B are not eligible to participate in this year painting competition but the consolation prize winners at State Level of both the Groups are eligible to participate but they would be considered for prizes only if they secure 1st; 2nd, 3rd position. • Use of collage I patchwork is not permitted in the paintings at All levels of competition. • Two paintings selected at School Level, sketched paintings at State Level and National Level would be the sole property of BEE, which will have the right to use it for any purpose it considers appropriate. • The decision of the Jury / Expert Committee at all Levels of the Painting Competition will be final. • Both Telugu & English Mediums. During September- October 2018. • 2 Best paintings each from Group A and Group B selected by the Head Master I Principal are to be forwarded to the TSREDCO office, Hyderabad on or before 25-10-2018. • Both Telugu & English Mediums. • During 10th to 20th November at the TSREDCO Office, Visvesvaraya Bhavan, Khairatabad, Hyderabad. • Jury / Expert Committee will select the best 50 paintings from "Group A" and 50 paintings from "Group B" out of the total paintings received from all the Districts. Thus selected 50 students from "Group A" and 50 students from "Group B" will be invited for the 2 hours duration State Level painting competition to be held during 10th to 20th November at the TSREDCO office, Visvesvaraya Bhavan, Khairatabad, Hyderabad. • During December 2018 at New Delhi. • The First, Second and Third prize winners at State Level Painting Competition of "Group A" will be invited to New Delhi to participate in the National Level Painting Competition of 2 hours duration during December 2018. • Only paintings of First, Second and Third prize winners at State Level Painting Competition of "Group B " will be forwarded to the National Level to evaluate at Delhi by a Committee of Experts I Jury nominated for their selection for National level Prizes. • Jury I Expert Committee will select 23 numbers of the best paintings from "Group A" from the paintings painted at National Level Painting Competition. • Jury I Expert Committee will select 12 numbers of the best paintings from the paintings received from all States pertaining to the "Group B". • The Director General, BEE will select 10 paintings additionally for BEE consolation prizes of Rs. 10,000/- each. • The awards will be presented to the winners of the National Level Painting Competition during the National Energy Conservation Day function on 12th December 2018. Organize a Painting Competition of 2 hours duration in your school on any working day. After the completion of painting competition, School Principal may select two best paintings and send them to the address of the Nodal Officer of their respective State/UT before as per schedule. Schools are requested to send the list of students participating in the painting competition (Category wise) to their State Nodal Officers. Schools with 100% participation at the School level Painting Competition will get their names included in the Painting Competition booklet prepared by BEE. Selected students will be invited at a designated place for State level on-the -spot painting competition of 2-hour duration on 14-11-2018. The selected students will be paid Rs. 1000/- each in cash by the Nodal Officer on the day of their participation at State level painting competition. Their travel expenses will also be reimbursed as prescribed in the scheme. The Competition will be for 2 hours duration and will be organized on 12th December, 2018. Results will be announced on 12-12- 2018. Boarding & Lodging expenses will be reimbursed. * Home or Office, saving energy is better. ** Get Friendly with Energy Saving Star.